The National Center for Families Learning (NCFL) is excited to announce that Earvin “Magic” Johnson, Chairman and CEO of SodexoMAGIC, will keynote the Toyota-NCFL Banquet Celebration the evening of Monday, October 9, 2017. The Banquet is a signature event of the Families Learning Conference, each year celebrating the tireless work of educators who are helping to raise families out of poverty and into academic and economic success. A basketball legend, businessman, and philanthropist, Johnson’s passion for improving the lives of families in poverty ties in perfectly with NCFL’s mission of working to eradicate poverty through education solutions for families. Earvin “Magic” Johnson has become the most powerful African-American businessman in the world. Having left the basketball court for the boardroom, Johnson has successfully parlayed his skills and tenacity on the court into the business world as Chairman and CEO of Magic Johnson Enterprises (MJE). MJE provides high-quality products and services that focus primarily on ethnically diverse and underserved urban communities through strategic alliances, investments, consulting and endorsements. Johnson shocked the world with his unprecedented partnerships with STARBUCKS as the only franchisee in the history of the company, owning 125 stores; and notably his alliance with Sony to develop Magic Johnson Theaters. Both ventures served as catalysts for redevelopment in urban communities and are literally the blueprint for engagement and success with urban consumers for Corporate America. These historic partnerships cemented Johnson as a reputable businessman, provided financial strength and garnered corporate support. For over 30 years, Johnson has developed MJE into a conglomerate that is comprised of multiple business entities and partnerships. Currently, he is a co-owner of the Los Angeles Dodgers, a Major League Baseball Franchise and the Los Angeles Sparks of the WNBA in partnership with Guggenheim Sports and Entertainment. Johnson has controlling interests in EquiTrust, a $14 billion financial services company; ASPIRE, an African-American television network; and SodexoMAGIC, a food service and facilities management company. Johnson has also invested in Magic Airport Holdings and Yucaipa-Johnson, a $500 million dollar private equity fund. Johnson also serves as Chairman and Founder of the Magic Johnson Foundation, where his relentless commitment to transform Urban America continues through HIV/AIDS Awareness & Prevention Programs, Community Empowerment Centers, and the Taylor Michaels Scholarship Program. The Foundation currently has 160 students on scholarship through their Taylor Michaels Scholarship Program, 18 community empowerment centers that helps to bridge the digital divide, 5 HIV/AIDS Clinics assisting all patients regardless of their ability to pay and has tested over 40,000 individuals. 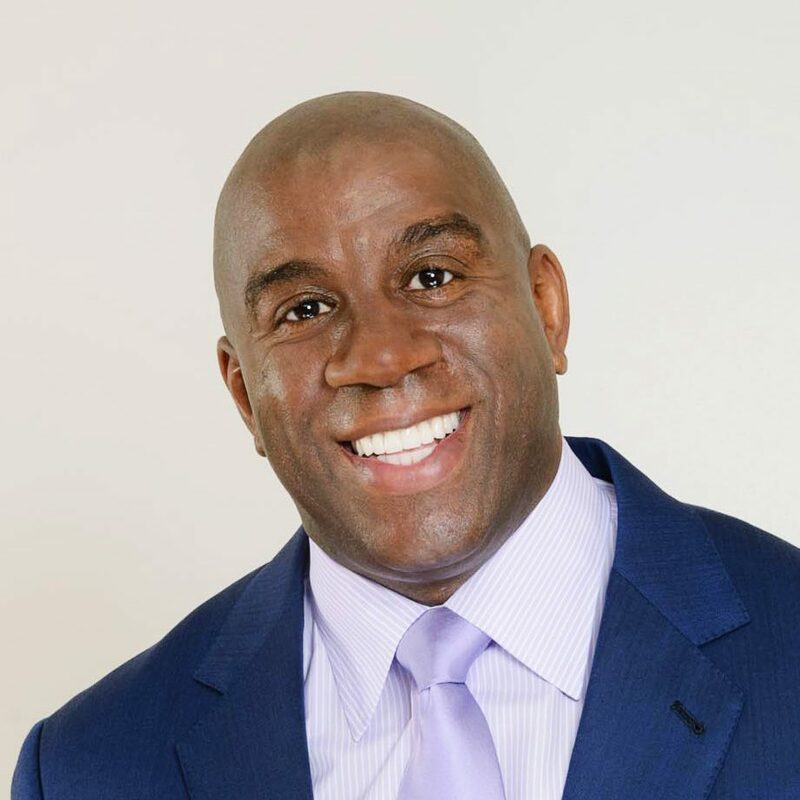 He continues to transform communities through all of his business and corporate partnerships including both Adecco to create Magic Workforce Solutions, a premiere staffing solutions provider and Edison Learning to develop Magic Johnson Bridgescape Academies, a high school drop-out prevention program. His commitment to work with major corporations and partners to bring jobs and high quality products and services to underserved communities remains un-wavered. What he BELIEVES is reflected in what he DOES, and what he consistently does – is make a DIFFERENCE in the lives of others.